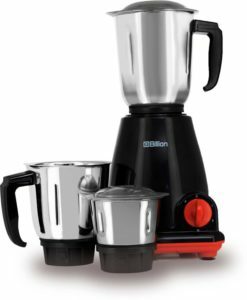 Today I would doing Billion Mixer Grinder Review. This product is exclusively available on Flipkart. Billion is a relatively new company. However, their products have been getting really popular lately. So, we now will get into the technical review of their mixer grinders. I would do a feature and price comparison of all their products. You can have at look at their entire range here on Flipkart. You can also check out our list of best mixer grinders in India. There are three main variants that are available currently. The major difference between these three is the Wattage. Billion mixer grinders are available in 500, 550 & 750 Watts. I will be clubbing together the MG121 and MG122 billion products together for the first review. This is because they are essentially the same product. The only difference between them is the colour combination. 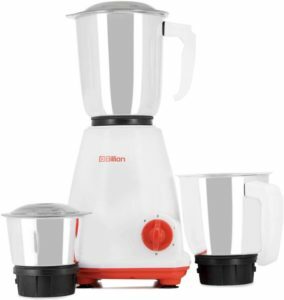 This is the cheapest Billion mixer grinder that you can buy. The mixer is fitted with at 500 W motor. The product does makes some noise (Lower compared to other brands in the same price range) but you cannot complaint much as this product is really cheap. It comes with three stainless steel jars. Two for blending & grinding. While the third is smaller one which can be used for making chutney or grinding spices. The product works well. You might have to open up the lids and mix the food manually once. The blades and the jar are really well made for the price. They dont look fragile like other brands in this price category. Comes with one year domestic warranty by Billion company. 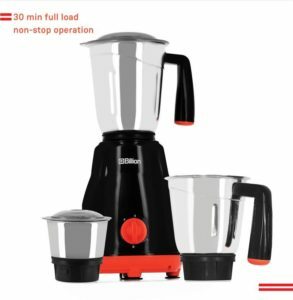 Go for this product compared to similar priced mixers from other brands. This is one of the earliest models that Flipkart launched. There is hardly any difference between this product and the one list below. They are also very similarly priced. The mixer is very compact and comes with three different jars. The jars are distinctively bigger compared to other brands. The handle are much better (More comfortable and sturdier) compared to the product above. The grinding quality is really good. You can use to it quickly grind your daily needs in a matter of minutes. The jars are made out of good quality stainless steel and have a nice rubber grip on the lids. The mixer also comes with safety features. If the motor overloads, the product will auto shut off. The product also has shielding beads. These beads help stop the radio interference with other appliance while functional. 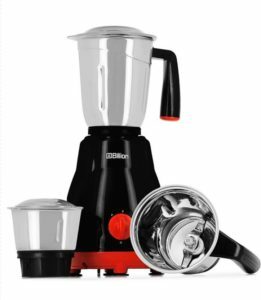 This mixer grinder is a real value for the money your pay. You can surely buy this product any day. However, Rs. 100 more will get you the newer model below. The model also has an additional grating functionality. This is an excellent product in this category of 500/550 W. You get great performance for the price you pay. Must buy! 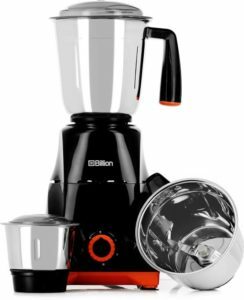 We now come down to the last and most powerful billion mixer grinder in our review. The design of the product looks very similar to all other products I reviewed so far. However, It does have a better finish to it. Have a look at the speed adjustment knob below. It does look very stylish. The motor makes less noise compared to other brands. The performance is good. However, you will need to keep you hand on the jar lid while grinding. If you fill up the jar too much the food might come out due to the sheer speed of the motor. All other features are similar to the product above. You get a lot of bang for you buck. The motor is powerful and grinding quality is good. The build of the product is very durable. The product is not perfect but it is truly a value for money. How do I reach Billion Customer Support Team? If you have any issues with the product or if you need any further information you can easily reach their customer support team. Details of the same are listed on this page. 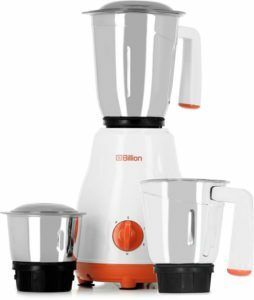 I do hope this review of billion mixer grinders helped you purchase the right product for your home. Do share your purchase experience in the comments section below.